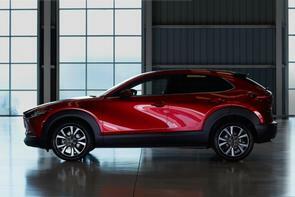 This is the Mazda CX-30, a new crossover from the brand that sits between the existing CX-3 and the CX-5 models in the manufacturer's line-up. Aiming to offer the city-friendly dimensions of the CX-3 with the interior practicality of the CX-5, the CX-30 measures 4,395mm long, 1,795mm wide, 1,540mm high and has a 2,655mm wheelbase. It looks similar in the body to the CX-3, but has more pronounced body cladding around the wheel arches, while inside is a driver-focused interior replete with Mazda's usual MZD infotainment and generally well-sorted ergonomics. Boot space stands at 430 litres with all five seats in place, almost perfectly equidistant between the CX-3's 350-litre cargo bay and the 506-litre load area on offer in the CX-5. The company says technologies included in the CX-30 include eight-speaker Mazda or 12-speaker Bose audio systems, i-Activ all-wheel drive with G-Vectoring Control, i-Activsense active safety features (including a driver monitoring system, for the first time) and the latest SkyActiv engines - likely petrol and diesel, with one option being the clever SPCCI SkyActiv-X engine we've already tried in prototype form.